This Ethiopia holiday is a tailor made trip following an eleven day itinerary, which can be tweaked to suit your timeframe and interests. 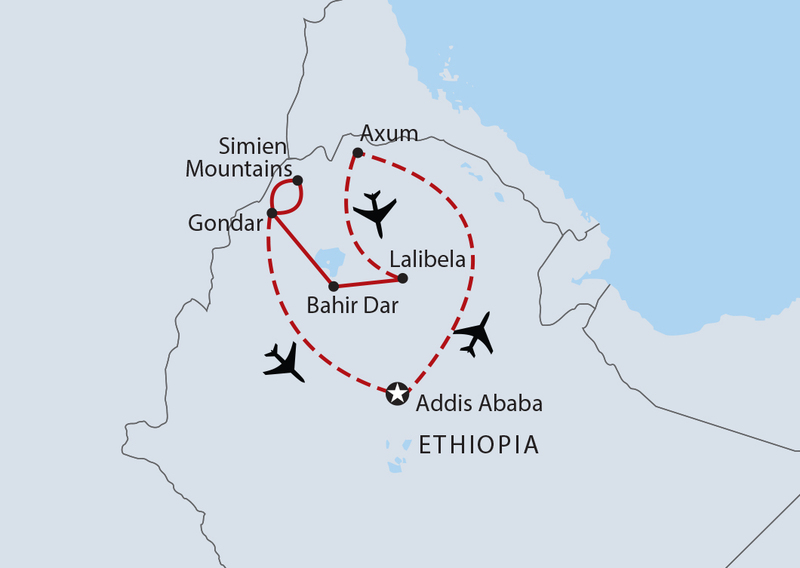 Starting in the capital city of Addis Ababa, your journey begins with a flight to the historic northern region of Axum. You will also visit the famous rock cut churches of Lalibela, Ethiopia’s largest lake, and the stunning Blue Nile Falls. 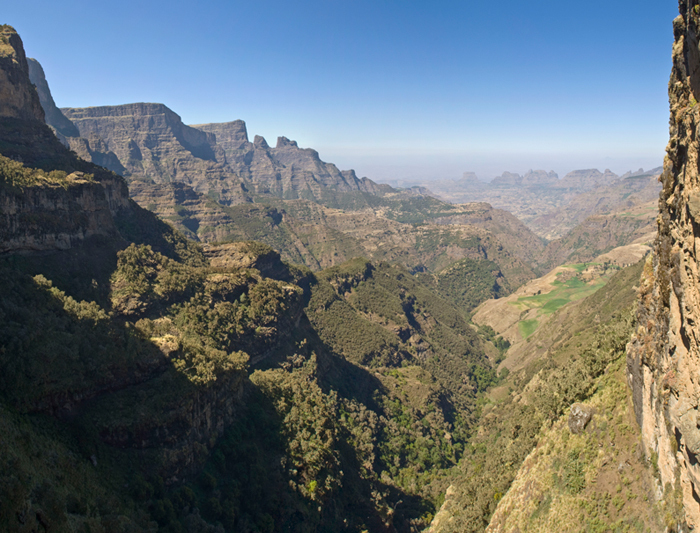 Nature lovers will relish their time in Ethiopia’s mountains, with guided hikes in the Simien Mountains National Park. Here you will see jagged peaks and deep gorges as well as wildlife wonders such as baboons, the Walia ibex and lammergeyer vultures. Ethiopia surprises and enchants. A tailor made private tour is the ultimate way to explore this remarkable country. Arrive in Addis Ababa, Ethiopia’s capital. Depending on when you arrive, there should be time for a half day city tour to see some of the key highlights, including the palace of the former Emperor Haile Selassie, the Ethnological Museum and the National Museum with its cultural and archaeological exhibits. Fly to Axum, once the centre of the ancient Axumite Empire and reputedly the seat of the legendary Queen of Sheba. The city dates back to around the 10th century BC and is best known for its connection with the Ark of the Covenant – stories tell that it was brought here by the son of Solomon and the Queen of Sheba, and it remains here to this day, in the church of St Mary of Tsion, which we visit, although not the Ark itself, hidden away from outsiders. 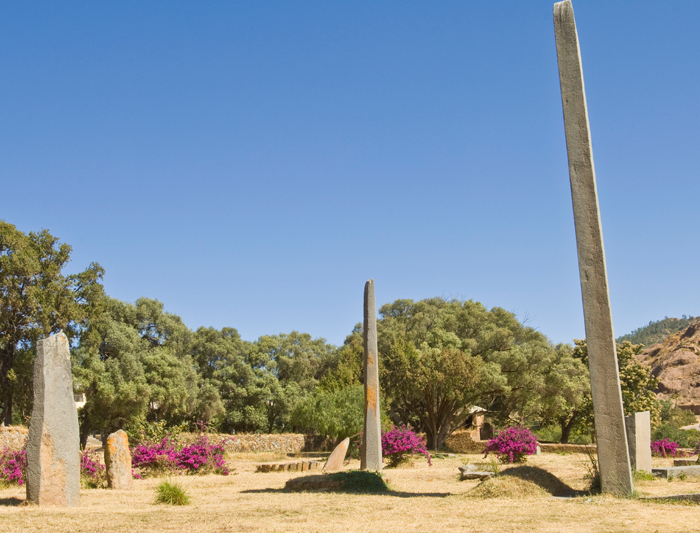 We also visit the imposing collection of stelae, granite monoliths dating from pre-Christian times and decorated with symbolic engravings that bear witness to the previous importance of this now remote corner of Ethiopia. 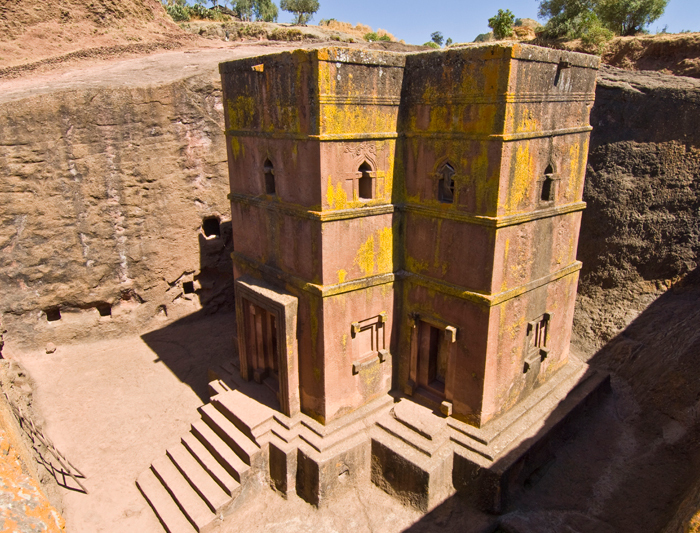 Fly to the magical town of Lalibela with its magnificent rock cut churches. Located at an altitude of 2,600 metres, the city contains eleven monolithic churches that were built in the 12th century and are carved out of pink granite; many consider them to be one of the wonders of the world. Each church has a unique architectural style; all are superbly carved and most of them are decorated with well-preserved paintings. This morning we visit the cave church of Nakuta La’ab, outside of the town in the surrounding countryside. In the afternoon we continue our exploration of the churches in town. These are still in use and many have small cells dug into the surrounding walls where ascetic monks live. Today we drive to Bahir Dar, a pleasant city located on the shore of Lake Tana, the largest lake in Ethiopia. There are a number of islands on the lake, several of them with churches and monasteries of considerable historical and cultural interest. Our drive takes us through picturesque landscapes and upon arrival we visit Awura Amba village. 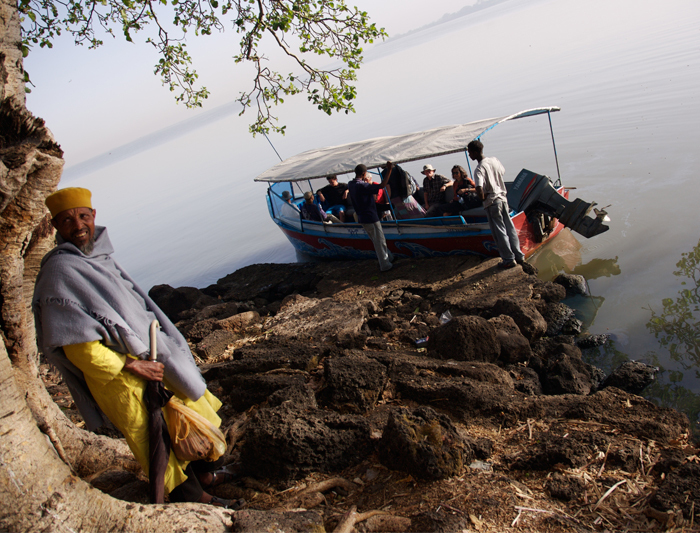 This morning we take a boat onto Lake Tana to visit the various island monasteries. This afternoon we head to the impressive Blue Nile Falls, a hundred metres wide and plunging forty five metres to the ground, giving rise to steam clouds and rainbows. We walk to a viewpoint for the falls, crossing a 17th century Portuguese built bridge along the way. 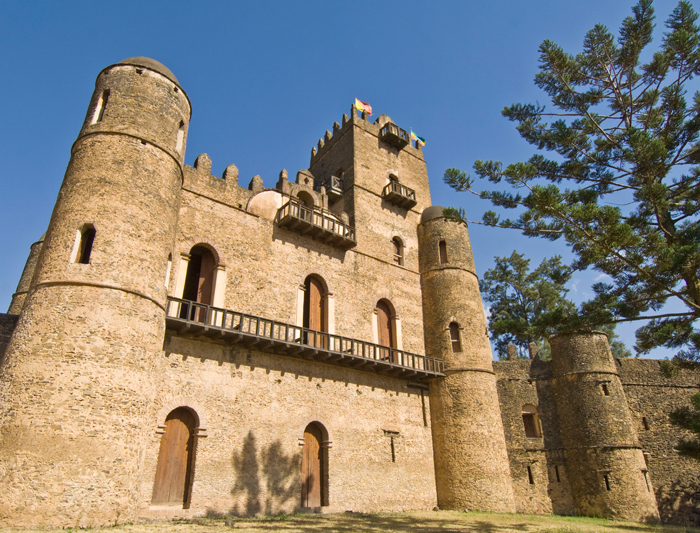 Drive to Gondar, ‘Africa’s Camelot’. The city is renowned for its collection of castles and royal buildings which seem more European than African in origin, and numerous theories abound over their construction. We visit the Royal Enclosure to see the palace of the King Fasiladas and other superbly preserved buildings, then head to the delightful church of Debre Berhan Selassie (Light of the Trinity), located at the summit of a hill, surrounded by fortified walls, and with an interior decorated with beautiful frescoes. Drive to the breathtaking landscapes of the Simien Mountain National Park, one of the most beautiful areas in all of Africa. Six hundred million years ago, these mountains were an enormous volcanic mass; rain and ice have carved deep fissures into them creating one of the greatest sculptures on the planet: peaks, canyons, gorges, clefts and pointed amethyst-colored pinnacles like obelisks. The mountains are home to a good amount of wildlife, much of it endemic and including large troops of gelada baboons and the endangered Simien wolf and walia ibex. We explore the mountains on foot to give us good chances of spotting the creatures that live here, as well as meeting friendly villagers in traditional settlements. Today you have a full day to enjoy exploring the stunning natural beauty of the Simien Mountains. Continue our exploration of the park in the morning, and then drive back to Gondar for the night. Today you will be transferred to the airport for you internal flight to Addis. 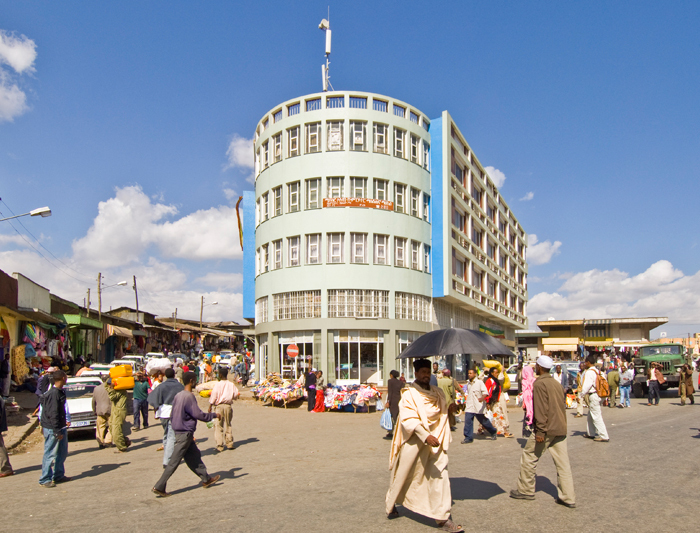 Upon arrival you will be met and driven the short distance to Debre Zeit, home to several crater lakes and a popular weekend getaway spot for Addis Ababa residents. You can spend the day visiting the lakes or doing some light hiking (circling Lake Hora takes 90mins). The area is very popular for bird-watching. There are several lake-side establishments for lunch and even a spa. When you are happy to return to Addis Ababa you will have a day room available for your use before transferring to the airport for your departing international flight.